Effects of Jedi T cell injections on normal pod-EGFP mice. (A) Time course for the experimental protocol. 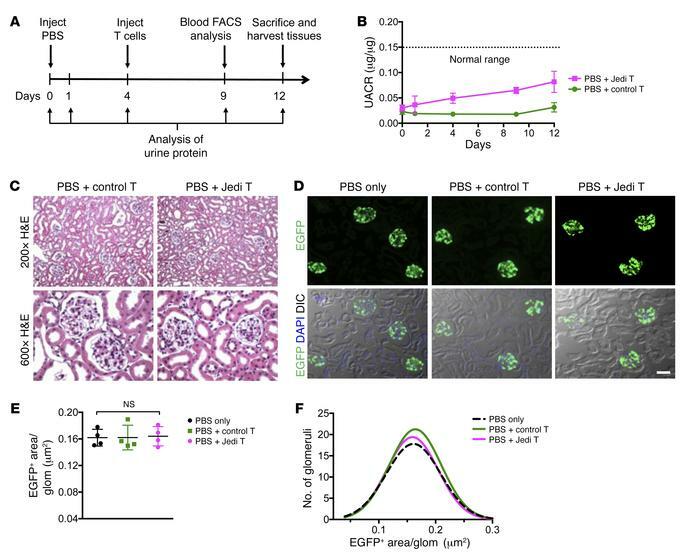 Four days after intraperitoneal injection of PBS (0.1 ml), pod-EGFP mice were coinjected with LV.EGFP and either control T cells (n = 4) or Jedi T cells (n = 4). Mice with PBS injection only served as controls (n = 4). (B) Urinary albumin-to-creatinine ratios (UACR, μg/μg) tested for all time points were within the normal range (<0.15 μg/μg) for both PBS plus control T cell– and PBS plus Jedi T cell–injected mice. (C) Representative H&E-stained images of pod-EGFP kidneys. Original magnification, ×200 (upper panels); ×600 (lower panels). (D) Representative images of EGFP fluorescence (top row) and merged images of EGFP, DAPI, and differential interference contrast (DIC) to identify glomeruli and tubules (bottom row). Scale bar: 50 μm. (E and F) Quantification of the EGFP+ area in pod-EGFP mice, as EGFP+ area per glomerulus (glom) (E) and size distribution curves for EGFP+ area per glomerulus (F) (n = 4 mice, 381 glomeruli analyzed for PBS-only group; n = 4 mice, 442 glomeruli analyzed for PBS plus control T cell group; n = 4 mice, 420 glomeruli analyzed for PBS plus Jedi T cell groups).